This article is sponsored by Kia Motors America. We were given a 2017 Kia Niro Hybrid to take on a road trip adventure in the mountains. This in no way shaped my opinions in this post. This article highlights our second destination, Linville Falls, NC, as part of a seven-day road trip adventure in the Smoky and Blue Ridge Mountains. We set out from Pigeon Forge, TN and drove through the Great Smoky Mountains, along the Blue Ridge Parkway and north into Linville Falls. This beautiful area of the Blue Ridge Mountains is home to miles of wilderness and wildlife. On our first day there we enjoyed the drive through the Smokies and stayed in our first ever tiny house. On our second day we explored Linville Falls and Grandfather Mountain. This is a photo journal of our adventure. Be sure to look up @FairytaleTVLR #FallintheMountains on twitter to see more photo content!!! The all-American road trip is a timeless adventure. No matter who shows up, you’re bound to either hate each other or love each other by the time it’s over. For us, taking a road trip as a family was important. My nine-year-old son and I were just approaching a year with my partner Sean so, some much-needed bonding was in order. Kia sponsored our adventure and gave us a Kia Niro Hybrid to drive. It was the perfect crossover for the journey and the perfect season. Practical advice: Fall colors vary by elevation and recent weather patterns. What may be brown at the top of the mountain can be bright and vibrant at the bottom. Also, some valleys could have already had their leaves fall off while others are still holding on. Our drive took place on October 17-23rd. I went back in the first week of November for more the brighter photos. Plan your trip for the end of October into the beginning of November. You can always call the BPR (828) 348-3400 and the SMNP (865) 436-1200 for a verbal update since the fall colors vary from year to year. When leaving Pigeon Forge you get the chance to drive through Gatlinburg, a small Swiss-style ski village at the foot of the Great Smoky Mountains. In the Smoky Mountains National Park you’ll find plenty of opportunities to pull over and take photos, go on hikes, explore historic sites and even spot wildlife. And in the fall, when all the colors come to life, it’s one of the most incredible experiences ever. The drive through the Smoky Mountains is incredible any time of year but it’s especially beautiful in the fall. Winding roads lined in towering fall colors invite you to take in the marvels of one of the most scenic landscapes of the eastern region of the United States. There are a variety of things to see in the Smokies. Roadside hiking trails, wildlife, and historic structures can take up a good portion of your day. If you’re looking to do more than just drive, I would allow four hours for a proper Smoky Mountain adventure. We took many moments during our drive to take little hikes and enjoy the day. We were lucky enough to catch wild elk while in the Smokies. Sean and Gauge having a moment as they look out into the mountain vista. We took a moment to take in the views while driving through the Smoky Mountains. Newfound Gap at the top of the Smoky Mountains. The drive through the Smokies will take you about an hour to an hour and a half (not including stops). When you get to Cherokee and exit the park, that’s where you’ll get onto the Blue Ridge Parkway. I highly recommend you get an old-fashioned road atlas for this portion of your trip. There is little to no data on these roads and the parkway is not available on GPS. Also it’s very slow. This particular portion of the road was an average 40 mph. What would have taken us 2.5 hours took us 8. So be sure to factor that in. However, I find that the segment of BRP in North Carolina is the most beautiful and well worth the drive. This little town in the northern region of North Carolina is home to the Linville Falls Gorge, Linville Caverns, and Grandfather Mountain. You can easily spend two days hiking and exploring this area. Check out these links for planning tools to Grandfather Mountain and for Linville Falls Gorge. Note Grandfather Mountain is now $25 per person to enter from the vehicular side, if you hike in from the State Park side it’s free.We spent our second day in Linville Falls exploring these natural attractions. Just off the Blue Ridge Parkway at mile marker 316 you’ll find Linville Falls Gorge. The gorge is called “Grand Canyon of the Southern Appalachians” for its spectacular views and three-tiered waterfall. You can get all the information you need about the hiking trails and visitor center on the National Park Service website. Sean took a moment to enjoy the view of Linville Falls. Jeans featured: Liverpool Jeans. PS I love these jeans on him. And they are super soft! The Grandfather Mountain attraction towers near 6,000 feet above sea level. A mile high suspension bridge swings over the mountain’s peaks for visitors to overlook the breathtaking valleys below. In the fall the colors are rich and add depth to the already spectacular 360-degree view. You can also pay a visit to their zoo home to local wildlife such as bears, cougars, and otters. In the wild, you can also see Bald Eagles and deer in their natural habitats. For more information on visiting the attraction visit the Grandfather Mountain website. Taking the parkway to Grandfather Mountain. I love this hike at Grandfather Mountain. On Sean: Liverpool Jeans. I love that Noreen is an adventure dog! The Airbnb tiny house that we stayed at was perfect! Set on a campground beside several other tiny houses, this miniature cabin gave us everything we needed. This loft house came with one bathroom/shower, was stocked with kitchenware, Wi-fi and had a nice fire pit outside. We did have to use our blankets (which I’m glad we brought), but it was super cozy. We shopped for camping food just before we arrived which was perfect for a night spent by the fire. And in the morning, we watched the sun come up. We spent a year with the Kia Niro Hybrid and we love this car! Coming from a Kia Sorento, it was a little bit of a change to get into a crossover, but the comfort and handling of this car made it easy to fall in love. I live just outside of Atlanta which means I deal with a lot of heavy traffic in all kinds of weather. I always feel super confident behind the wheel. The safety features and advanced technology give me a sense of my surroundings and driver control that I’ve never had before. And with the amount of money we save driving a vehicle that runs on EV and fuel getting a combined 50 mpg, adventures are that much more doable. Want to know more about this crossover? Check out Kia’s cool website full of specs and video content here and check out the video below! The Kia Niro was the perfect car for this drive. It hugs the switchbacks like it was made for the mountains. Be sure to check back to see what we did after we left as part of our Fall in the Mountains Adventure with Kia Niro Hybrid. I’ll be writing about; Stargazing Along the Blue Ridge Mountains and Staying in a Luxury Teepee in Lynchburg, Virginia. 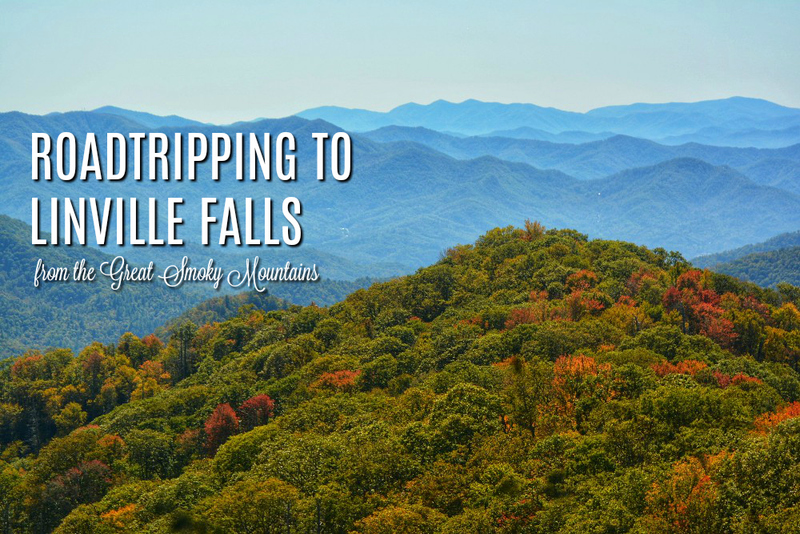 Heading to Linville Falls? Or are you shopping for a new car? Ask me anything in the comments below and I’ll get back to you right away with my best answers!